The exhibition, Creativity Within the Beauty, features at The Platform Gallery, Clitheroe from 24 January to 11 April 2015. The arts and crafts within and around The Forest of Bowland are as unique, diverse and beautiful as the wildlife, landscape, habitats and eco-systems, which the Area Of Outstanding Natural Beauty (AONB) represents and cares for. 2014 saw the 50th Anniversary of The Forest Of Bowland being designated as an Area Of Outstanding Natural Beauty, providing us with the inspiration for this unique opportunity to showcase the artistic talent found within and inspired by this stunning landscape. Creative inspiration has no boundaries; its development has no timeline. It can be the bleakest of days or the full glory of the seasons at its best. The harmony of nature with the land and its habitat within the Forest of Bowland district are the elements of my creative vision. Since coming back from Australia to the UK, and in particular my living here within a natural private park setting in this Area Of Natural Beauty, has refreshed my appreciation of what might be perceived as the ordinary, to become something extraordinary in all that I see. 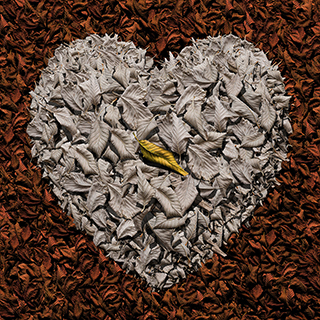 This group exhibition features four of my latest works showing the beauty of single leaves or seeds – chestnut, acorn, sycamore and beech; all of these leaves are photographed individually and put together digitally as 30″ x 30″ photographic prints. Approximately 20 – 40 leaves per artwork are photographed in different positions but under the same lighting conditions so when they are assembled, the light direction is the same, making the image more realistic. 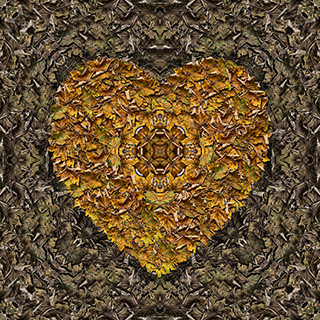 The leaves can be arranged into any shape – heart, square, circle and can be re-worked as kaleidoscopes which create incredible tile-like patterns. I have been an art director/graphic designer for over 40 years and using cameras for longer. Now, with those years of experience behind me, making images with the camera – photography and paintography – is what I enjoy most of all.